There is no drinking or drugs allowed on the facility. Please email request if party is larger than 8. 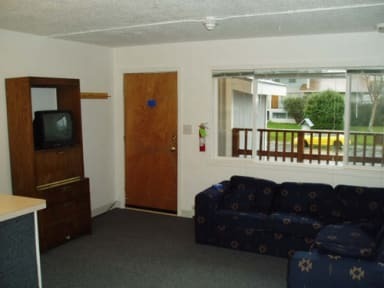 Enjoy our many facilities including coin-op laundry and Wi-Fi, and relax in our living room after a long days traveling! Meet and get to know fellow backpackers. Prepare meals as often as you want in our guest kitchen! Phenomenal hostel. Hardly even feels like a hostel, more like a motel and an absolute bargain for what they charge. Would definitely stay again. Thanks for everything guys! I was very impressed by the friendliness of the staff the place very clean and every one was very helpful. I recommend it to everyone. A wonderful addition to the hotels and housing options for travelers on a budget in Anchorage. Staff and management very responsive and helpful. Rooms clean and well equipped. Re the score for security - this is NOT a reflection on this hostel - its simply a reflection of shared room housing... There was no concern or reason for concern during my stay. I would recommend this hostel for anyone looking for a shared housing deal well situated in the city's mid town section. 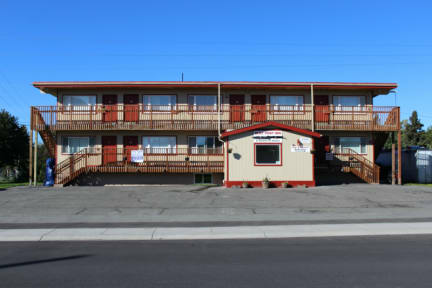 Great place to stay in mid-town Anchorage. If you don’t mind walking, it’s an easy walk downtown too. The kitchen and living room area of each dorm is an extra bonus for a hostel. John and Cindy were incredibly hospitable, couldn’t recommend BPI more! You have an appartement with your own kitchen and bathroom for the price of a room in another hostel. It's great and the staff is very nice! Most worth knowing for a newcomer is that the setup at this hostel is quite different from others - it's a former apartment building, so there are no collective facilities but rather a bunch of one-bedroom apartments with bunks. Not so much a group social feel, but more privacy and easy kitchen access. Plenty of local knowledge from the host. Buses to downtown tourist zone aren't far away, if you make the effort to figure out the system. Did not have my booking. Said hostle world must forgotten to send them the reservation. The person working there was very hostile and rude. The hostel has nice, big rooms, but the beds are worn out.